North Seymour is located just north of Baltra, which has an alternative name of South Seymour. 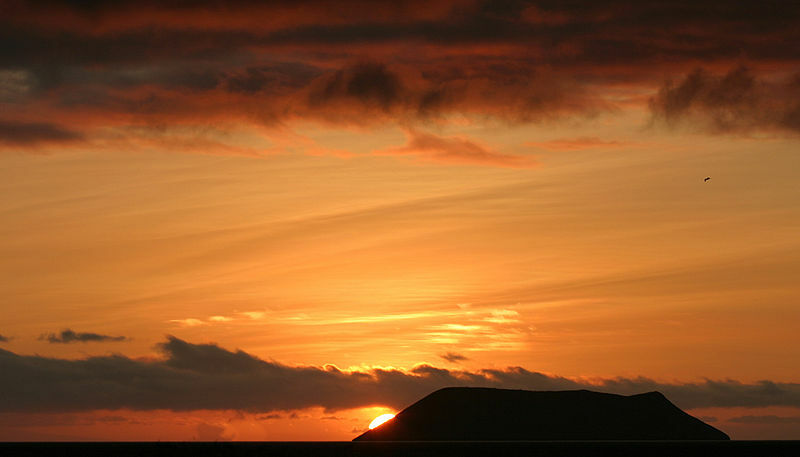 These two islands share some similar characteristics, in particular their interesting geological history. 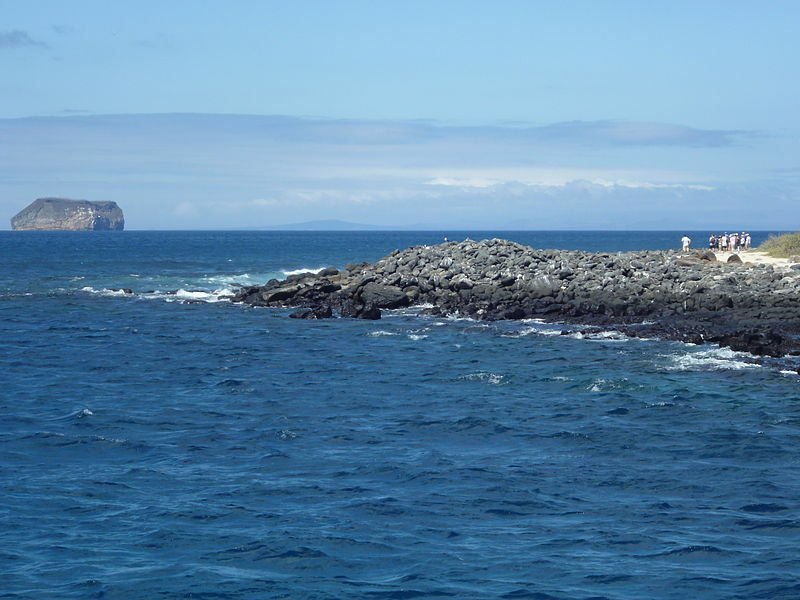 Unlike most of the Galapagos Islands, Baltra and North Seymour arose from the Pacific Ocean as a result of a seismic uplift, rather than from an underwater volcano that erupted from a hot spot. (Read my complete post on the geology of the Galapagos Islands, specifically the movement of Tectonic Plates.) A seismic uplift happens when tectonic plates collide and one pushes up while another is pushed under. The two plates together lift the earth’s crust to make room after the collision. Said another way, a seismic uplift proves the physics principle that that two solid objects cannot occupy the same place at the same time. The collision that results in the uplift often takes place under water, in which case we cannot see the results on Earth. 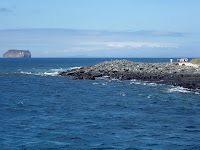 On the other hand, in extreme circumstances, an entire island – such as Baltra or North Seymour – emerges from the ocean. This alone makes North Seymour a force of nature. Give this a second thought. Imagine yourself as a spectator. You would have seen one massive moving landmass smash into another, with the stronger one on the bottom literally raising the upper landmass and creating such energy that an entire new island was formed. The mind boggles! 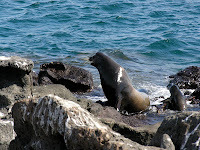 All of North Seymour is rocky and rugged, both the coastline and inland surface. 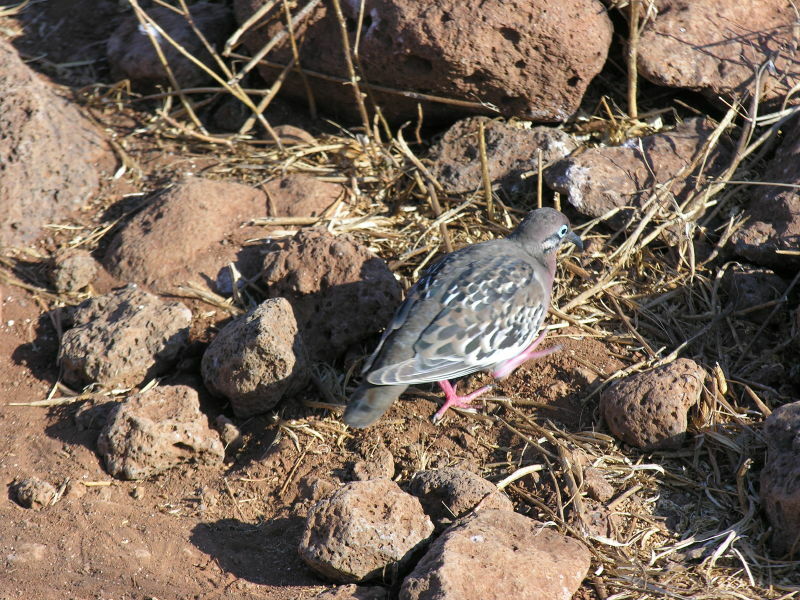 It supports a ground cover of low, bushy flora and endemic Galapagos cactus. 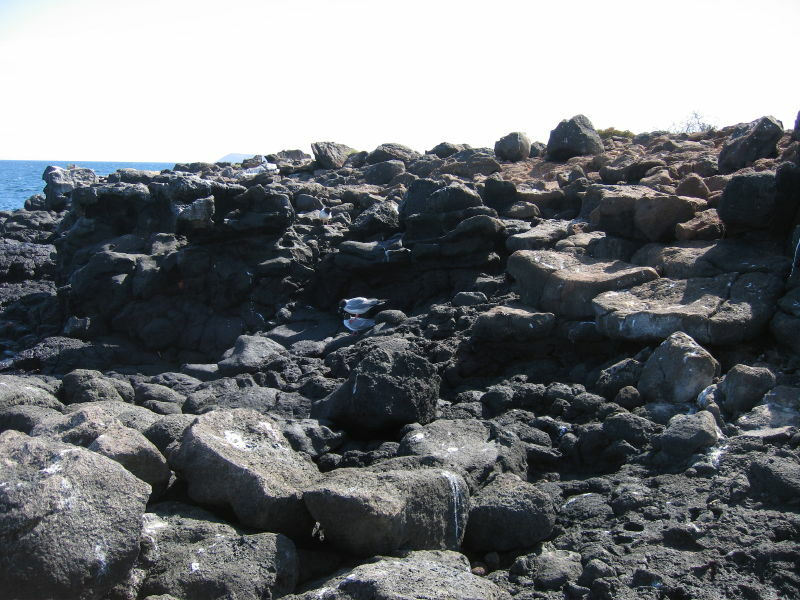 You will experience this largely monochromatic terrain as you hike the short (1.2 mile) visitor trail that crosses the island. But, you see more traveling that short distance than you can imagine. Contrast the harsh static appearing ground cover to the sky above North Seymour, alive with the sounds and sights of pelagic birds. 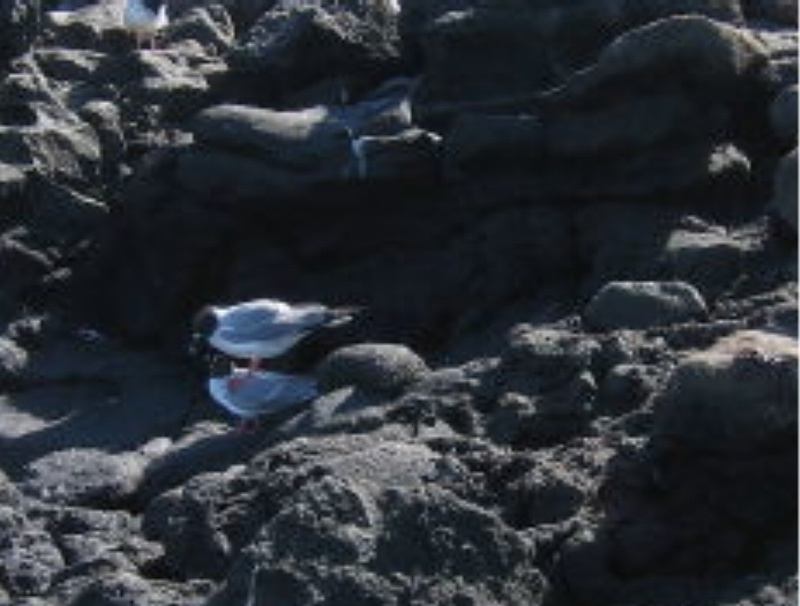 North Seymour lifts my spirits because of the dramatic and dense bird life that soars above the Pacific Ocean against the Galapagos blue sky. 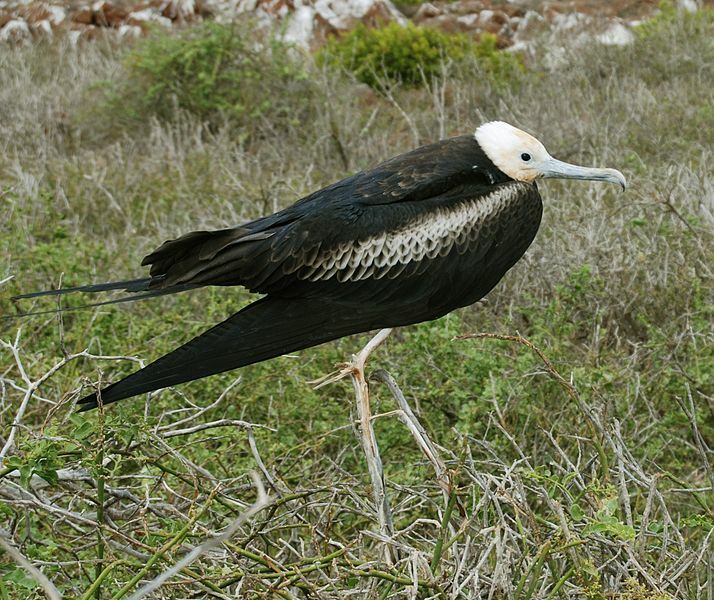 Species such as Frigatebirds, Red Billed Tropicbirds, Galapagos Shearwaters, Blue Footed Boobies, Pelicans, Brown Noddies, and Swallow Tailed Gulls populate the skies. As many times as I have watched these birds dive beak first forcefully and with great drama diving into the water for their "Catch of the Day" I never tire of the sight. It is always exciting and a spectacular display of swiftness, grace and energy. Naturally, if these birds are in the sky, they have to land somewhere - and North Seymour is home to many of them. There is a very large population of Blue Footed Boobies. 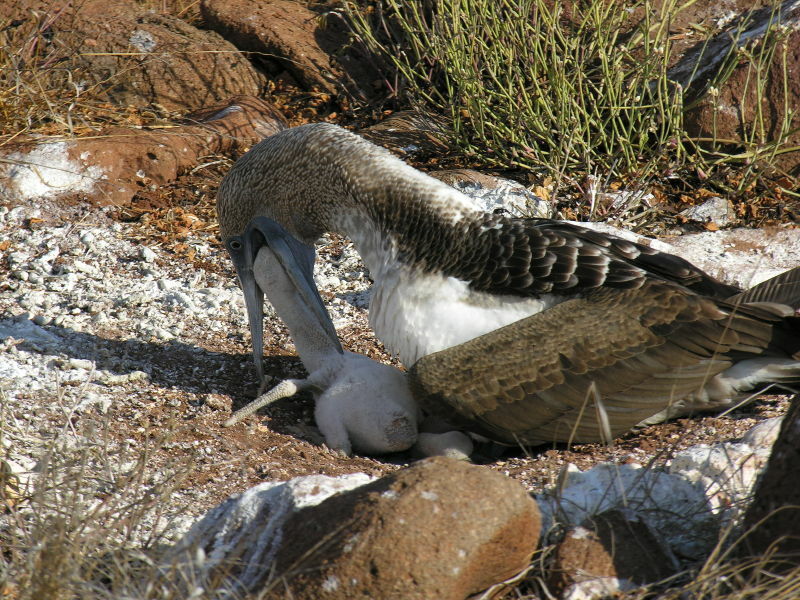 The boobies live on the ground and use small bits of plant debris to form their nests. 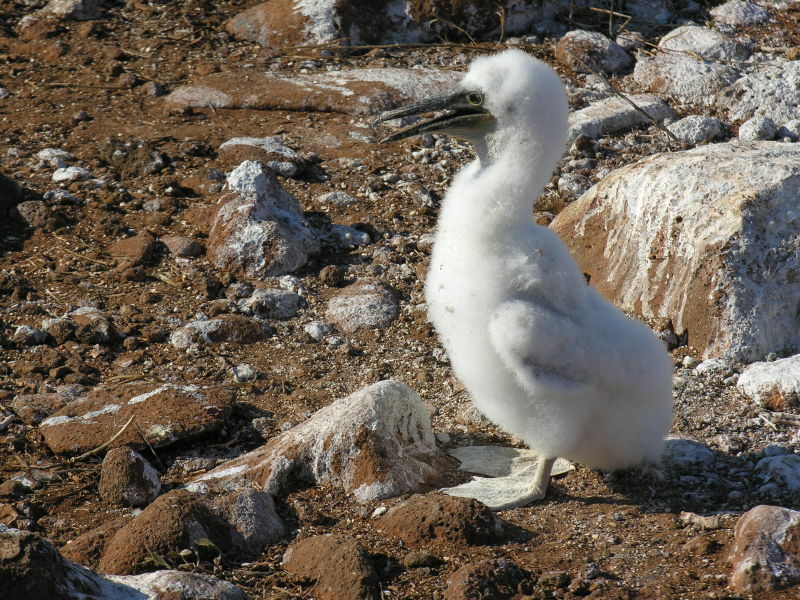 Take a look at my earlier post about the Blue Footed Boobies on Espanola Island to get a feel for the mating ritual of these most delightful birds. out their chests in a magnificent display of red. 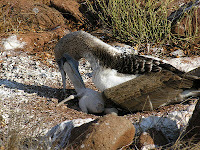 The girl frigatebirds seem to love it! visit you will have the opportunity to learn about their mating behaviors. It's fun to watch. The males roost on the tree branches with their red sacks all puffed out as they calling madly to the females flying about above them. A female flies around and around until she spies a particular male who happens to capture her imagination. Once she has chosen, she settles down beside him for a courting ritual. Eventually, when the time is right, mating occurs. Together, they build a nest, each one bringing bits of material in its mouth to the other. 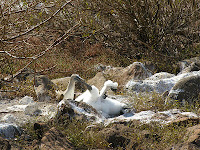 The egg is laid and both parents, the male and female, take turns caring for the egg and the chick. 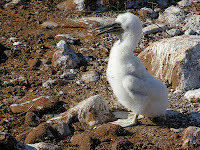 The chicks get quite large before they are ready to fly and you will see adults feeding chicks who seem to be as big as they are. 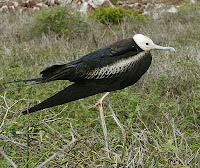 But, a juvenile has different coloration and does not develop the wing strength to fly for several months. 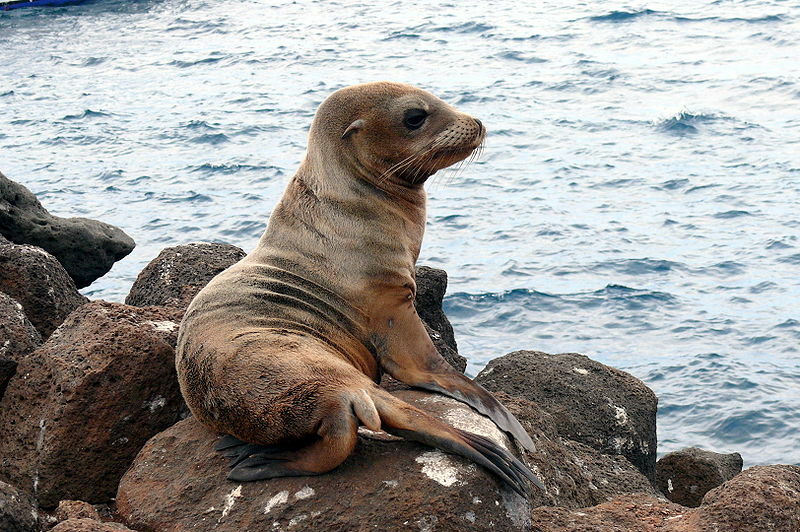 Of course, North Seymour wouldn't be in the Galapagos if it didn't have sea lions. These playful creatures will not disappoint. There are land iguanas living and burrowing on North Seymour as well. You might see them protecting themselves from the shade under the island's dense cactus. Sometimes they seem to be in hiding; others you may see a dozen or even more posing for the camera. 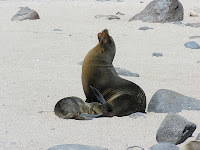 If I were asked to describe North Seymour in a few words I would say that it is small, but mighty and definitely worthy of a visit to the Galapagos Islands.